May 2, 1865 – The body of President Abraham Lincoln leaves Chicago, bound for Springfield. The city has grieved for two days as the fallen president’s remains lay in state at the Court House, allowing 125,000 people to pay their final respects. The Chicago Daily Tribune reports, “The appearance of the body had not sensibly changed. There was the same holy, calm expression, and the same placid smile resting upon those marble features.” [Chicago Daily Tribune, May 3, 1865] At 7:30 p.m. 15 “young ladies, each dressed in white waists and black skirts, with black scarfs thrown over their left shoulders” throw white roses over the lid of Lincoln’s coffin. An honor guard than lifts the coffin and carries it to a funeral car drawn by twin black horses furnished by the American and United Express Companies. The procession proceeds down Washington Street to Market Street, then to Madison and along Canal Street to the terminal of the St. Louis and Chicago Railroad where the coffin is placed in a railroad car as a choir sings solemn music. As the funeral procession passes the corner of Washington and Market about 20 feet of the sidewalk gives way under the weight of spectators and a number of mourners are thrown seven or eight feet to the earth below. A few minutes later another sidewalk at Madison and Market gives way, and over a hundred mourners are thrown down with “nearly everyone who stood on the broken sidewalk … more or less injured, some quite seriously.” Frequent enough for the paper to note the problem was the rush for “relics” of the event. The Tribune reported, “Ladies eagerly picked up the leaves of flowers which had been strewn on the coffin, and put them carefully in paper for preservation. Scissors were pulled out to clip pieces from the drapery, and positive roughness had to be used in many cases to prevent the complete demolition of everything that had been used in the funeral obsequies.” At 9:30 p.m. Train No. 58 leaves the station with the Master Mechanic of the St. Louis Railroad, J. Jackman, in the engineer’s seat. An engine precedes the funeral train by ten minutes taking “every precaution … to avoid accidents.” It had been a deeply moving 48 hours, as the Tribune solemnly reported, “Our father, our friend, our deliverer, is dead; the first outthrust of grief, great, overwhelming, though it were, was yet broken by the excitement of the occasion, and our subsequent wailings even have not been without sad interest. But now that the form is forever departed, naught save the memory of the man remains, now comes the rank desolation and sorrow, which though not so demonstrative, is more affective. The head of the nation, of the race, is gone from among us – even his form has departed. 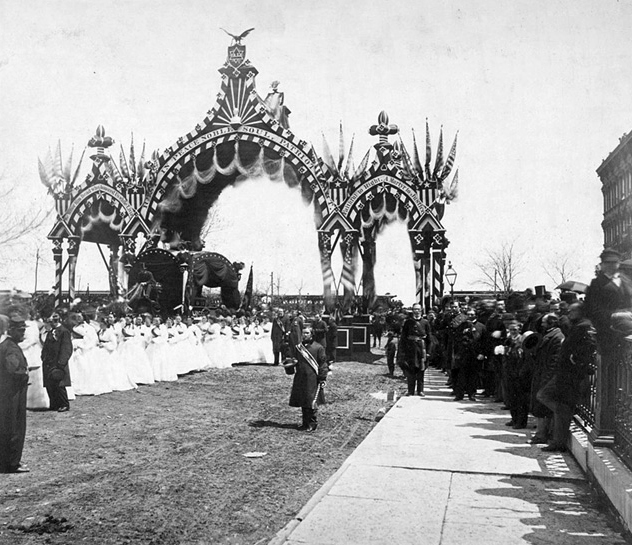 We mourn him now as indeed gone; the place which knew him so long, shall know him no more forever.” Abraham Lincoln's funeral procession as it arrived in Chicago is pictured above as it begins at Twelfth Street and the lakefront. May 2, 1923 – The announcement is made that the American Furniture Mart building, currently under construction on Lake Shore Drive between Erie and Huron, will be the largest building in the world when it is completed. 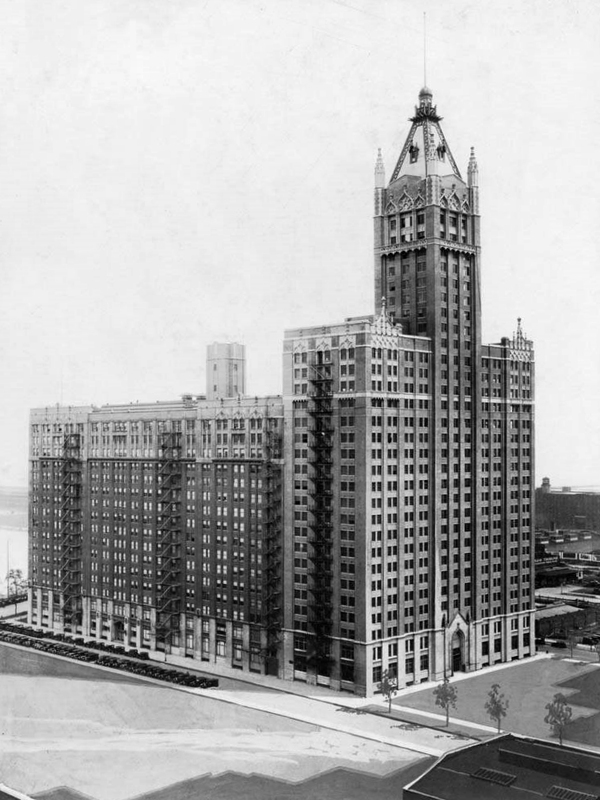 Lawrence Whiting of Whiting & Co., the agents for the property, discloses that a careful check has revealed that the Mart’s 1,500,000 square feet will exceed its nearest rival, the recently completed General Motors building in Detroit, which supports 1,321,000 square feet. Between 1979 and 1984 the massive building became one of the first great old buildings in the city to complete a successful program of adaptive reuse. Today it has 415 condominiums divided between three separate condominium associations and 420,000 square feet of office space, dedicated primarily to medical offices associated with the extensive Northwestern medical facilities that form a large part of the neighborhood to the west.